Access about 4km upstream of the turn off for Aldeyjarfoss where the braided section ends. Egress at the point where the Mjoadalsa meets the Skalvandafljot. There is a bridge over the Mjoadalsa and just before the confluence there are some wires running across the Skalvandafljot. This section starts with a 2-3 metre sloping drop which should be run down the centre. It is followed by a few more little rapids all very easy which lead up to a big foss. On the right of this there is a three stage chicken shoot. This needs very careful inspection. What looks like a big swirly eddy on the right of the first drop is actually a large siphon. One member of our team disappeared down this and reappeared again in the cave at the bottom of the first drop. It took the rest of the day to retrieve the boat. If you are going to shoot this drop make sure you go far left. The stopper at the bottom is a back looper and there is an undercut wall below it. The other two drops are both run down the right near the bank, inspection is vital. A few small rapids are followed by two slightly harder ones. Keep river left on this section. There is a big foss on the right. Again this has a chicken shoot, this time on the left. We ran the first drop of this and then wimped out of the next three drops. They all have big walled in stoppers at the bottom. It would probably be OK in low water. The river then widens out and there are two large sloping slides. The first is run down the centre and the second down the left. Care is required for the next section. 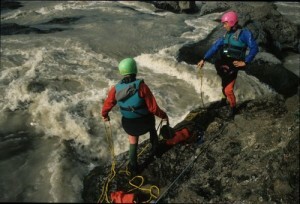 A large rapid is quickly followed by a 15 metre waterfall which is not for canoeing. The rapid is one that needs inspection, the foss needs portaging. 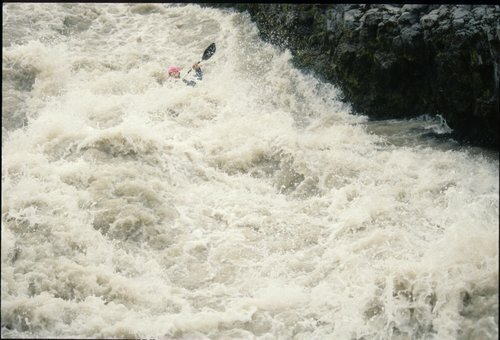 Get out in the small eddy on the left and get back in at the bottom of the fall. 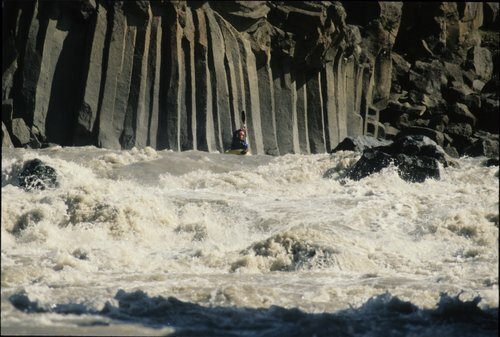 The remaining rapids offer nothing too dangerous but are still well worth doing.